Every proposal has an Invoices & Payments tab which contains a helpful summary of payments that are directly related to the proposal. If you have integrated your Practice Ignition account with an accounting platform such as Xero or QuickBooks, you can see all invoices that have been created for your proposal in this view and the subsequent collection for each invoice. If you are using our payment function without integrating with an accounting platform, you will see a list of the payments that have been collected for you to match up in your accounting system externally. At the top you can see how much has been invoiced to date in light grey, and the total value of the proposal excluding estimates. As invoices are created via Practice Ignition, a line will be added to this list where you can see the date that it was created with a link to the invoice in your accounting system below it. If payments are enabled for that invoice, you will see the date that funds were debited from your clients Credit Card/Bank account, and the date it cleared into your own bank account. Clicking on the red links will take you through to our payments tab where you can see further details on each transaction. For invoices which are collecting payments some time in the future you can see Payment collection date and Expected Clearing date for each invoice here as well. On the right hand side you can see the ex-tax value of the invoice. Re-send invoice to (Accounting System): If you need to re-send an invoice to your accounting system (eg. it was accidentally deleted) you can use this action to re-send the invoice details over to create a new invoice. Please note, it will generate a new invoice with a new invoice number. Collect payment: If payments were disabled or not required during acceptance. If you enable payments for the proposal, you can use this action to collect payment on an invoice that has already been created but not had payments collected already. Adjust Payment Collection Date: If a payment is yet to be collected, you can alter the collection date from default. Learn more about it here. Cancel Payment Collection: If a payment is due to be collected, but the due date has not passed a user can cancel the pending payment. This will just skip collection for this invoice and future invoices will continue to collect. This will only be visible if the terms/due date setting is greater than 0. Retry failed payment: If a payment has failed, you will also be able to click the 'retry' button to retry the payment. On the right hand side you can see if there are any invoices scheduled to be created, or services to be billed on completion that are yet to be invoiced. If you have invoice schedule enabled, you can also edit your invoice schedule from here. 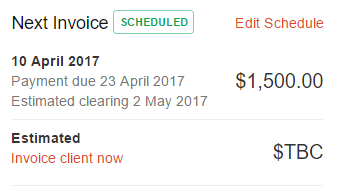 If you have services waiting to be invoiced, you can also click 'Invoice Client Now' to create an invoice. 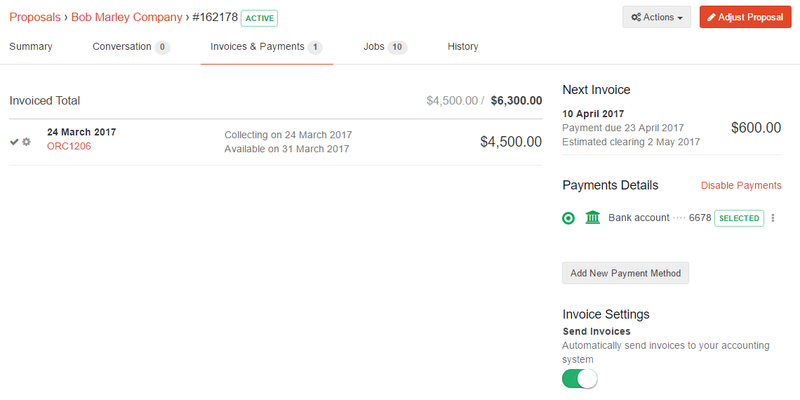 For Estimates or Bill on Completion services, you can click the 'Invoice Client Now' button to create an invoice and collect payment if you have payments enabled. You can also toggle on or off if you want invoices to be pushed across to your accounting platform. 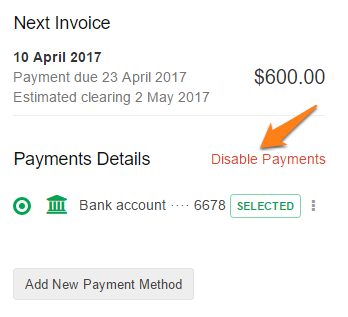 Below the Next Invoice section, you can also enable or disable payments from this view and edit your client's payment details.